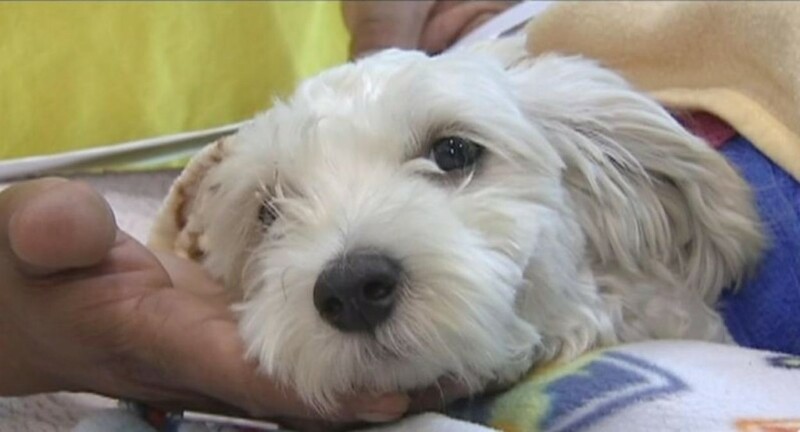 CULVER CITY, Calif. (KABC) — “Gordo,” a little dog that became a victim, then a celebrity after a wild high-speed police pursuit through South L.A. Wednesday night, had his hind leg successfully operated on Thursday afternoon. Gordo was injured when a stolen van ran him over on 87th Street between Wadsworth and Hooper avenues Wednesday around 9 p.m. Thursday night, after his operation, doctors said it’s likely he’ll need more surgery. After the two pursuit suspects were apprehended Wednesday night, Gordo, a year-old Maltese mix, was located and rushed to City of Angels Veterinary Specialty Center in Culver City to receive emergency medical care. He sustained major injuries to his rear right leg and hip area. According to surgeons, Gordo’s owner had two options: get the leg reattached or have it amputated. Before going into surgery Thursday afternoon, Gordo’s veterinarians said they had good news. “The plan, based on the pre-operative testing that we’ve done with X-rays, is to try and salvage his leg,” said veterinarian Dr. Kim Carey. Santos Son, Gordo’s owner, says the family pet is lucky, and that the dog wants to live. Son said his kids cried when they saw how badly injured Gordo was. The cost of Gordo’s care will run in the thousands of dollars. Donations have been pouring in to help the family pay for his care. Gordo’s owner says he’s thankful for the help the family has received. Gordo’s long-term prognosis, considering what he’s been through, looks pretty good. Gordo has been receiving an outpouring of support from people on social media, with the hashtag #savethewhitedog even trending on Twitter. The animal hospital says it has received thousands of dollars in donations. Eyewitness News viewers who wish to donate and help Gordo and his family with veterinary expenses can visit www.accessanimalhospitals.com. via Gordo, dog hit during South LA car chase, expected to survive | #savethewhitedog hashtag rallies support | abc7.com.